Dining has become an experience to Millennials, who now take as much pleasure in discussing and sharing photos of their meals as they do in eating them. From fine dining to food festivals to food trucks, this young generation likes sharing their latest and greatest food experiences with their social media networks. As a result, more and more Millennials are turning to social media to post their meals online, pin photos of their dishes, check in at restaurants, and get recommendations from other tech-savvy food lovers. MediaPost.com recently conducted a food and beverage survey that explains why eating has become a digital delight for this generation. The study showed that more than one-quarter of respondents often took photos of their meals and shared them online with friends, while 36 percent said they enjoyed viewing the food photos of others. This generation loves sharing their lives online and they consider food to be an important part of their personalities. 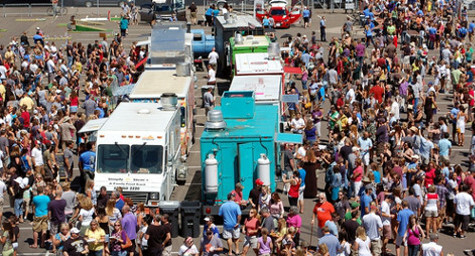 Their desire for adventure, fun, and social interaction makes Millennials a natural audience for the rapidly emerging food festival and food truck scene. These venues allow them to eat, explore, experience, and engage with friends all at once, and then post every detail of their dining escapades to the numerous social media networks that keep popping up to meet market demand. In fact, 21 percent of survey respondents had been to a food festival, with nearly half having eaten at a food truck based on their “hip” status. The study predicted that the food truck scene will continue to gain momentum with these app-happy Millennials since it provides a real-life version of an app that lets them experience new tastes and cultures. Beyond eating out, this generation also likes to share recipes via blogs, photos, and social media channels. A shocking half of this generation use recipes weekly and a majority regularly “pin” and “re-pin” recipe photos on Pinterest. With their penchant for using food as a social sharing experience, more and more Millennials are expected to join this digital dining trend. This bodes well for the future of social media as it continues to evolve to satisfy the tastes of every generation. To learn more about the latest trends in marketing to Millennials, contact MDG Advertising today at 561-338-7797, or visit mdgadvertising.com. MDG Advertising, a full-service Florida advertising firm with offices in Boca Raton and New York, NY, specializes in developing targeted Internet marketing solutions, exceptional creative executions and solid branding and media buying strategies that give clients a competitive advantage. Our core capabilities include branding, logo design, creative, digital marketing, print advertising, mobile marketing, media planning and buying, TV and radio, Web design and development, content marketing, social media marketing and search engine optimization (SEO).